Why should you play casino slots? Still on the fence about playing casino slots online or off? We hear you. There are lots of casino games to choose from. Loads of table games. Tons of video poker options. Great specialty games. So what makes slots so special? We’ve got a few ideas. Read on for our top 5 reasons why you should play casino slots. If you play casino games to chill out after a hard day or week at the office, the last thing you want to do is up your stress level. Sometimes, you want to sit back with a drink and not think about anything. Slots are relatively mindless. Place your bet, choose your paylines, and press Spin. Then, get paid out. Rarely do you need to think, unless you enter a bonus round that requires you to make a decision. When you sit down to play at a table game, you know what you’re getting into. In Blackjack, you’re getting paid out even money, unless you hit a Blackjack. In Roulette or Craps, you can make more depending on how you bet, but there really aren’t any surprises. 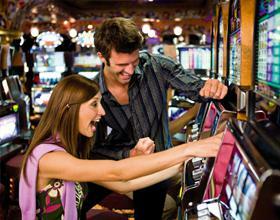 In slots, however, a simply $1 bet could end up leading to a 6-figure payout if you hit the jackpot. Table games, no matter how exciting, can get a little mundane. Even if you’re switching from Casino War to Blackjack to Baccarat, you’re still moving from green felt to green felt to green felt. And you’re still dealing with cards. Bottom line? The atmosphere is the same. But with online slots, or the live version, every experience is drastically different from the last. If you’re comparing table games to slots, the latter is much better for someone on a budget. Let’s take live casinos, for example. 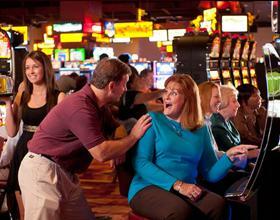 Most table games have minimums of between $5 and $25, depending on the casino. But slots at the most high-end machine could have minimums as low as a nickel per spin. Penny slots are still available at many land-based casinos. In the online world, table games are much more affordable, often coming in as low as only $1 per bet. But even still, slots are way cheaper. Playing free casino games is nothing new online. You can play as much as you want without risking real money when you play at Palace of Chance. That doesn’t just go for slots. It goes for table games too. But typically, in the live casino world, you have to play for real money if you want to enjoy most casino games. But slots offer free game rounds where you can actually play for free and win real money on the house. That runs contrary to table games where you ever bet requires you to grab something from your bankroll. Convinced? You can give casino slots a try right now at Palace of Chance. We have one of the Internet’s best selections of online slots to choose from, so sign up and play now.